Photo contributed Randy Schield Shelby Simmons battles for the ball in Webster’s 3-0 win over Spalding on Oct. 23, 2013. Simmons has torn her ACL for the second year in a row. Just minutes into the Webster Women’s Soccer team’s first preseason game against St. Louis Community College, Shelby Simmons fell to the turf at St. Louis Soccer Park. With the memory of last year’s anterior cruciate ligament (ACL) tear still fresh in her mind, Simmons retreated to the sideline after the non-contact injury. She tested out her right knee on the sideline during the Aug. 21 game and decided to return to the field, but she would not last long. Just 30 seconds later, she fell again, making her question her health and soccer future. Simmons, a sophomore striker, played in 15 of the team’s 19 regular season games in 2013, her freshman season. 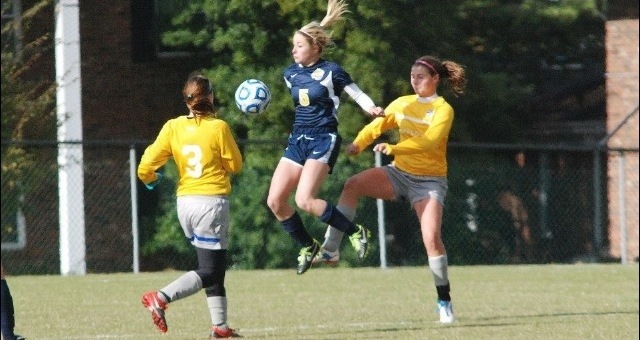 She overexerted herself during a Nov. practice session, leading to her first ACL injury. She underwent surgery on November 27, 2013 and spent the next nine months working her way back to fitness. She spent three days without feeling in her leg as a result of a numbing agent applied during surgery, two weeks of being bedridden and nearly nine months rehabbing and building strength. She finally rejoined her team at the beginning of August, with success. But after two weeks of practice and the first practice game, Simmons was in an all too familiar spot, the doctor’s office. She scheduled an MRI (Magnetic Resonance Imaging) and was given the results by Dr. James Burke, the same doctor she visited in 2013. He broke the news in less time than Simmons spent on the field in 2014. The same doctor, the same office and the same drive home all brought the memories and feelings of the devastating injury that she had suffered just a few months before. Now she had to decide if she wanted to rehab all over again or give up the sport she loved. Simmons didn’t make up her mind until she spoke with her coach for the first time. She used a cliché from a different sport to reveal her decision. Her surgery will be in December, to avoid missing classes. After the surgery Simmons will follow a different path the second time around, and will work to change her luck. She had a physical therapist for three months after her first surgery, but then took the rest into her own hands. She worked out every other day to rebuild muscle, without the direction of a personal trainer. This time around she plans to have professional guidance beyond the physical therapy. In addition to a personal trainer, Simmons will have her positive philosophy, a philosophy she has gained from another tragedy. Simmons has a 26-year-old neighbor who was recently diagnosed with cancer. He has a wife and a one month old child. The doctors told him that he has just one month to live, which has given Simmons a surprisingly positive attitude. “What can I complain about? I’m having my knee fixed twice, I don’t have a month to live,” said Simmons. Simmons will be able to take a medical red shirt this year, saving a year of eligibility. She hasn’t set a date for her return, but her teammate Lauren Pratt knows it’s just a matter of time.